Our history is rich in fishing the Southern Appalachian Mountains in Asheville, North Carolina and the surrounding 150 mile radius. 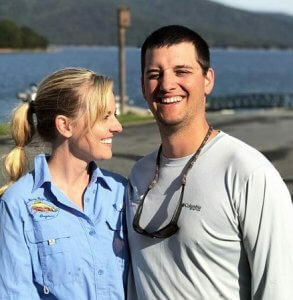 Southern Appalachian Anglers Guide Service, was founded by Paul and Kacie Kisielewski in an effort to give back to the Southern Appalachian region through sharing their love of fishing with others. Southern Appalachian Anglers LLC – Asheville Fly Fishing Guide Service was founded on the professionalism and expertise that our clients desire. All of our guides are patient, courteous, and hold many years of professional guide experience in Western North Carolina. Throughout the day on your guided fly fishing trip, you will find that every guide has his/her own unique fly fishing technique. Each one of their techniques is very effective for catching trophy fish. From Asheville, Paul grew up fly fishing for trout on local creeks and bass fishing on stream-fed mountain lakes around Western North Carolina. His fishing obsession started at a young age while spending time on his family property in Lake Lure, North Carolina. He became hooked on fly fishing and spent every second of his childhood learning about the creeks, streams, and rivers in Asheville, WNC. Paul has extensive knowledge about fishing mountain lakes and the rivers that run into them. In an effort to provide fun and safe fly fishing trips he is USCG Licensed. Born and raised in the mountains just north of Asheville, Kacie has been fishing for trout and smallmouth bass her entire life. Kacie fully manages our Big Brother and Big Sister Fishing Program. She has a passion for smallmouth bass, and she loves sharing her knowledge of fishing with the younger generation. When she isn’t on the riverbank, she can be found training for half-marathons, taking pictures of mountain lakes, or hiking with her dog. With a love for fishing, outdoors, and water conservancy, sharing our expertise with other anglers, inspiring or veteran, has been our passion, along with providing industry-leading professional guide trips around Western North Carolina’s most beautiful rivers, lakes, and backcountry creeks. Our guided trips in Asheville include fly fishing wade trips, float trips, and National Forest backcountry fishing trips. 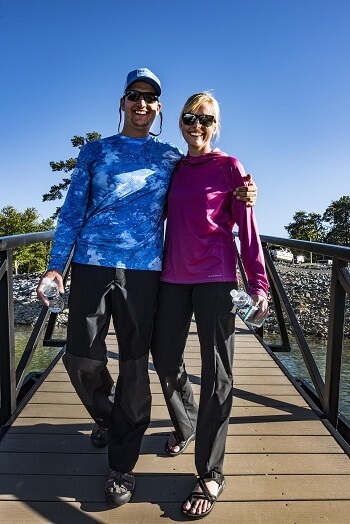 Our professional guide staff provides the ultimate fishing trip experience in Western North Carolina. We offer specialized expedition fishing trips, waded fly fishing trips, and fishing trips by boat. Regardless of the trip, we are committed to providing an exciting and memorable fishing experience!